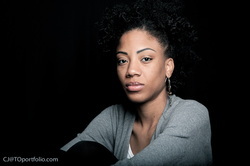 KEISHA-MONIQUE SIMPSON – I am a Toronto-born and based interdisciplinary artist (Poetry, Literature, Music, Film, Sculpting) of Latina, Caribbean, South-East Asian, European and African descent. I use my art as a means of self-expression, healing and exploration to push the culture of whatever art form I am using forward. Performing has given me the opportunity to share my work nationally and internationally as well as connect with others from various walks of life. I am passionate about The Arts, how it shapes, connects and documents the lived experiences of any and all members of society, how it is the greatest tool for disturbing the status quo, and how it has the power to transform and save lives. In 2010, I founded The ABENI Initiative which creates holistic alternatives to the growth and development of Black/Afro-descendant Girls, through the Arts. I create art because it affirms my purpose in life. I am an artist because it reminds me that I am alive. Keisha-Monique has since moved on to work on other projects, but we are incredibly grateful for the initial inspiration and foundation building that she provided to The Ride or Die Project. The Ride or Die Project Advisory Circle meet once a season to provide support, feedback and strategic direction for all of the initiatives of The Ride or Die Project. RAHEL WOLDEGIORGIS grew up in many working class and racialized neighborhoods across Toronto, euphemistically referred to as “high priority” neighborhoods by the City of Toronto today. She faced many obstacles that led her into a life of crime, drugs and gangs. Rahel recognized that her lifestyle needed to change if she wanted to live. She then turned to community organizing as way of challenging injustices that she herself faced and witnessed throughout her young life. Rahel decided to work with youth in her home communities and has been a restless community and student activist with an alphabet soup of organizations. Rahel is a proud alumnus of the Transitional Year Program (TYP) at the University of Toronto – a second chance program for students who lack formal qualifications to enter university. Rahel completed her Honors Bachelor of Arts at the University of Toronto in African Studies, History and Caribbean Studies & is currently pursuing a Masters of Arts in Social Justice and Community Engagement at Wilfrid Laurier. Her current research focuses on refugee student’s education in Canada. She is a proud mother to a brilliant eleven-year-old daughter. AINA-NIA GRANT has worked in the area of leadership development for over two decades. Through her work in corporate and non-profit environments she developed and facilitated various personal and professional development programs and has presented to academic, corporate and civil society audiences in Canada, USA, and Ghana. She is an accredited Life Coach, and has owned and operated her consulting business for over 10 years. Ms. Grant is the founder and managing director of Sacred Women International, a community-based organization that facilitates women to self awareness and personal empowerment through West African Spiritual principles and practices. Since 2009 this community has been inspiring women to be heard, acknowledged and accepted just as they are, while learning to activate political, social and spiritual changes by “Being The Change”. Ms. Grant studied extensively under the tutelage of Dr. Iyanla Vanzant and is a Minister of New Thought Ancient Wisdom with initiations in various indigenous practices. She is a recent graduate of the Women’s Leadership Program for women leaders across Canada sponsored by the Canadian Women’s Foundation in partnership with St. Xavier University-Coady International Institute. Ms. Grant is the former Associate Executive Director at Community MicroSkills Development Centre with oversight of MicroSkills innovative programs and services for women, newcomers and youth working to achieve social and economic wellbeing. Through the years, Ms. Grant has been recognized in the media in both Canada and USA including Heart & Soul and Planet Africa magazines and in 2008 was nominated as one of Toronto’s most inspiring women. RAKHI MUTTA was born in Kitchener, Ontario to artist-activist parents of Indian descent. Navigating both the Indian and Canadian culture while growing up often left her confused with many unanswered questions about identity. These challenges eventually became the driving force behind projects she chose to explore. Rakhi is a photographer and filmmaker with a background in International Community Development. She has travelled to, worked in, and taught in many countries across the world. The communities she spent her time with vary from; Displaced Peoples, Child Soldiers, Untouchables, and Victims of Violence. Locally she has worked with the Peel District School Board, Legal Aid Ontario, Toronto District School Board and more recently with Pathways to Education. Her sincere love for the arts and her passion for grassroots community work led her to mesh the two worlds together. She co-created an International Non-Profit organization Kahaniya; Sisters Sharing Stories with Natasha Daniel. More recently she started her own production company Ms.Mutta Productions Inc. which focuses on sharing stories of the diaspora. SHELLEY PARRIS. Born and raised in London, England, by her Grenadian parents, the youngest of three, Shelley Parris is a creative, expressive, extroverted and passionate soul, with a love for performing arts and expression through various artistries and a strong believer in the transference of energy. Professionally, Shelley practices a Psychological field having graduated from Surrey University with a Masters Degree in Forensic Psychology. Shelley now works within one of the U.K’s leading private secure hospitals with those suffering mental health and those institutionalised within custodial settings, helping support and implement therapeutic programmes to enable them with the tools to lead a more stable independent and healthy lifestyle. Fascinated by ones circumstances, exposure of various societal pressures and the effects it can have on behaviour, development, core values and beliefs, Shelley joined as a member of the advisory circle for the ride or die project to further her knowledge on the various life experiences of women both within the UK and across seas; to help them in making informed decisions and positive choices in their lives, to see how ones schemas and experiences differ and to gain insight on what women today are willing to ride or die for.